As a working father, it is always so tempting for me to consider sleeping in on a weekday or whenever I am off from work. The idea would be to have a good rest to recharge before facing work yet again. But somehow something deep down inside me would make me reconsider, to give up on the idea of rest, and to enjoy family time instead. And if cost is a concern (for me it is), there are many activities around the island that are mostly free too! These public playgrounds are definitely situated within a stone's throw from the neighbourhoods. It is only that the neighbour's playground always seem to be better than yours. I can still remember my childhood playground where I would spend hours with childhood friends, just playing with the very basic concrete structures and one single merry-go-round. Sometimes it is the company that matters! 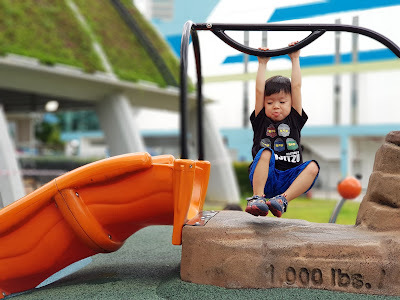 But of course if you are looking for those bigger, better and newer playgrounds, the two that you can check out would be the Marine Cove Playground over at East Coast Park, and the Admiralty Park Playground that are also easily accessible by public transport. Okay, this is something that MOST parents and children would like. Because it is clean, air-conditioned and totally comfortable for the whole family. In fact, you can find everything that you need at some of the bigger shopping centres. Let's be real, these places do not install water playgrounds or interactive play areas for kids of all ages just to have fun. The idea is of course for children to want to visit so that parents can SPEND at the malls. Maybe a meal there is justified for a fun day out at the malls, or you can simply just use the free facilities here! Check out the outdoor sheltered play areas in malls like Bishan Junction 8 and City Square Mall, indoor air-conditioned play area in Waterway Point or Marina Square or the water play at NEX or Sembawang Shopping Mall! The above are some of the places that you can bring your kiddos out on your days off from work and the whole idea really is spending as much time with the kiddos and family as possible. Of course with the right amount of cash, there are so many places one can bring the whole family to but the lack of it should never deter a dad from bringing the kiddos out! Some things lost, can never be found and TIME is one of it.